The Internet of Things is promising an almost completely networked, extremely dynamic adaptable production environment. Machine vision is taking an important role here. With big things in our mind, machine vision has to integrate into standard machine building. Integration of the cabling into machine building standards creates transparency and investment safety. The head of a classic “image processer” is often full of lofty goals. The engineer generally prefers to think in algorithms, SDKs, CPU and GPU power, etc. The practitioner then battles with the wiring, level adjustments, noise immunity and plug standards.Thus the task of fine tuning and matching of an image processing system's components very often is still a major assignment. In fact, quite frequently this demands an enormous input of time to implement the system. Over the years, many system integrators have developed their own recipes and in some cases devised exotic workarounds. Inevitably, quite often this results in installations which are complex, difficult to maintain and far beyond clear. Yet it always boils down to the one issue: sync the image recording to the conveyor or machine cycle, synchronize the illumination with exposure, utilize image data, make decisions, produce good/poor signals. Increasingly often (in robotics) lens focus as well has to be adjusted, aperture or image field (zoom) have to be followed up. All of this calls for the smartest possible idea, together with lean structure and operation. Essentially the concern is about the software itself and the practical cabling around the recording site with its associated expenses – expense in software and hardware. And, as a long-term investment, all of this should be transparent, maintainable and simple. In terms of software we are experiencing a quantum leap towards simplification with deep learning, new algorithms in the GPU and visual tools for image processing. On the hardware side, the cabling is still the same as 20 years ago - in the machine vision sector. Back in the 90s i.e., in machine vision the Hirose connector established itself as a medium for power supply and signals, yet without uniform pin assignment. For quite a few system integrators this resulted in smelly surprises. Today, we still have the Hirose connector – and still have neither uniform pin assignment nor uniform voltage levels. Nevertheless, image processing has taken important steps in achieving simplification in the direction of standards on the software side with GigE-Vision and GenICam. Regarding the standards, machine building is ahead of image processing: here we see robust, non-sensitive 0-24-volt signals and sturdy cable standards. All prominent companies in the PLC sensor and actuator industry provide connector solutions complying with certain standards for plug, pin assignment and functionality. Therefore, these systems are substantially faster to wire up and extend, independent of specific manufacturers. The M12 I/O standard is regulated for voltage supply, wiring sequence and colour code. An industrial replacement is also already available for the RJ45 network plug. The M12-8 “crossed” is now the standard up to 10 GigE. The pin assignment of a 3-pin actuator cable, for example, is defined. I/O replicators make child´s play of the PLC connection. 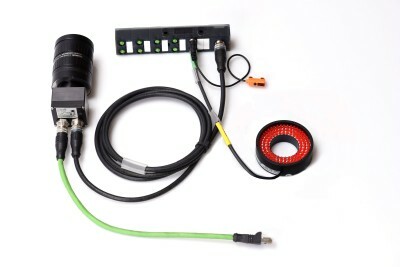 In the case of SmartCameras, the trend aims towards M12/M8 connections. This creates a direct communication with the machine and the integration is “fast and clean”. Good enough, this trend has been recognized by many Asian suppliers. The M12 standard is advancing within these countries. It is quite plain to see that simplification in image processing means complying with existing standards on the hardware side. Simplification stands for reducing the number of signal paths/cables as well as minimizing the number of components. Simplification implies to allow the components involved to talk to each other, on the level of industrial signals. The camera should communicate directly with the PLC, sensors and actuators. This helps avoiding unpleasant surprises, not only in connection with imprecise timing but also on the cost side. For more than 5 years, SVS-Vistek “BlackLine – Series” is offering the M12-12 for I/O connections and M12-8 for GigE data. In combination with a high protection class up to IP67, this provides a robust and industrial solution. All cameras from SVS-Vistek work with industrial voltage and I/O levels of 24V, are compatible with actuators and sensors in machine building applications. All cameras are equipped with identical standardized pin assignment already for many years. Many of these cameras boast with features like I/O signal processing and LED flash controllers on board. Standards such as those in machine building create acceptance and efficiency. Image processing has to achieve integration in this respect, and there is still work to be done. Special hardware solutions turn out to be expensive in the long run and will be replaced by lean, standardized solutions in the future. End customers benefit from an optimum long-term investment, system integrators from solutions developed quickly based on familiar standard components that can be maintained even years later, and which – as an additional benefit – they can readily justify and offer more economically to their customers. SVS-Vistek has been successfully implementing this strategy for years.